Sticks + Stones is a Canadian company with more than 20 years spent offering award-winning design services. Home Office Visits and HQ Tours are About to Change. Giving your best clients and out-of-office associates an Interactive tour of your Home Office is now easier, consistant and much more cost effective. We can enhance your tour with highly engaging multimedia tagging. 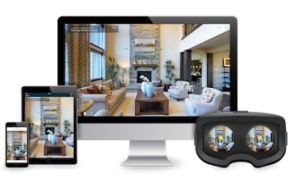 Being able to showcase your HQ is now easier, more engaging and highly sharable with Matterport True3D™ by ShowcasePros. Our Immersive 3D Tours attract and engage your online audience by creating virtual tours for businesses and venues. We provide an immersive 3D experience that is always on — even when you’re not. Your customers and prospects will get to know your business atmosphere — connecting with you even before they arrive for in-person visits. Not only Immersive, Interactive Tours, but High Resolution Photography, Video and Schematic Floor Plans — all from One Shoot. Your custom Home Office Tour is available on any connected device. Immersive tours are interactive increasing time spent on your company website or social media post. Your tour is highly sharable directly linking Facebook, Twitter, LinkedIn, and/or Pinterest. Sharing can also include hyperlinked email and text messages. We are Google Trusted Photographer and can publish to Google Street View, Google Maps and Google Business Page. Our tours are highly sharable directly linking Facebook, Twitter, LinkedIn, and Pinterest. Sharing also includes email and text message. We are Google Trusted Photographer and can publish to Google Street View, Google Maps and Google Business Page.